Senior Joseph D'Amelio calls up an Uber on his phone. Freshman Lindsay Noordsij was harrassed by an Uber driver over Spring Break. With Uber under fire for sexual harassment complaints at both the corporate and driver levels, some students are wondering if Uber is a reliably safe option for transportation. 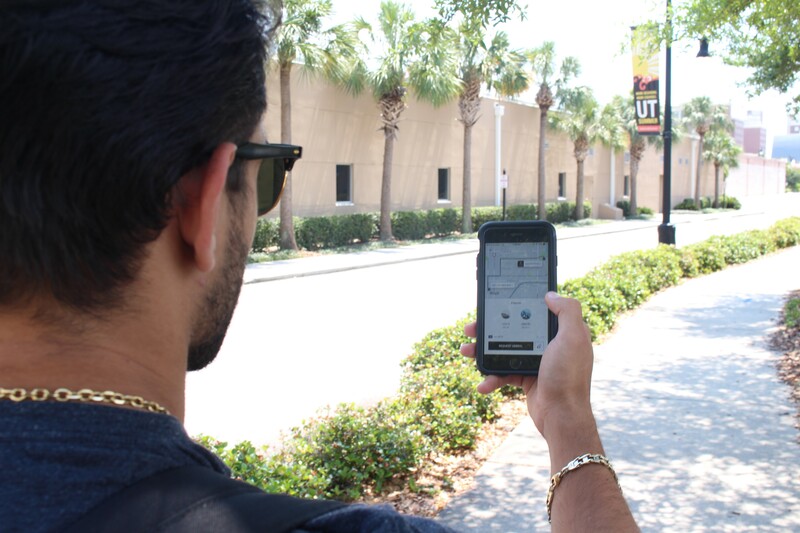 Sexual harassment by Uber drivers is a problem that has popped up in and around Tampa, according to students, particularly females, some of whom have had uncomfortable experiences in an Uber. Lindsey Noordsij, a freshman biology major, expressed concern with the way young female passengers are treated in Ubers, especially at night. One night during spring break she took an Uber back to UT and was presented with an uncomfortable situation where her driver put a hand on her leg, asked her to come back to his house and use his jacuzzi, and made other remarks that left Noordsij feeling unsettled. At one point she even threatened to take out her phone and call for help. “Maybe the Uber company isn’t regulating their staff very well,” Noordsij said. Noordsij isn’t alone in this situation. Many Uber riders are coming forward with allegations against their Uber drivers, claiming that they were sexually harassed, stalked or had an unpleasant experience during their ride. Some incidents have crossed the line from sexual harassment to sexual assault. In Santa Ana, California, 37-year-old Uber driver Angel Sanchez was arrested on April 1 for sexually assaulting a female passenger, according to the Los Angeles Times. The Uber driver may also have had previous victims, according to the article. Uber’s troubles go all the way to the corporate level. Female employees have made accusations of sexual misconduct similar to those made by Uber riders. One of the many internal scandals Uber has seen lately involved a former Uber engineer, Susan Fowler. She alleged on her personal blog that she was sexually harassed by her manager and that her complaints to human resources were ignored, eventually leading to threats by her manager to fire her because of her reports, according to Business Insider. Uber has initiated an “internal investigation into workplace practices,” according to The New York Times. Another UT female, Caitlin Whetstone, a sophomore management major, also had an unsettling experience with Uber. In her case, the driver might have made an innocent mistake, but the incident still rattled Whetstone. “I had a guy make a wrong turn off the highway and we were in a pretty sketchy area of Tampa. He said he was going to shut off the app so it stopped charging us, so I thought we were getting kidnapped, but then he turned onto Cass [Street] and it was fine,” Whetstone said. Despite multiple reports by students at UT of uncomfortable Uber experiences, including Whetstone’s, many say they will continue using Uber to get around. Jenna Manto can be reached at jenna.manto@spartans.ut.edu.